Dwarf planet Ceres, the largest body in the asteroid belt, has long been believed to possess a carbon-rich composition. This belief was founded on observations made by both telescopes on Earth and telescopes in space. Ceres has been classified along with 75% of all other asteroids as having class C (carbonaceous) composition, but a recent study shows it to differ remarkably from the other asteroids in its class in that it has both wet and dry materials on its surface. A team at NASA’s Stratospheric Observatory for Infrared Astronomy (SOFIA) has found substantial amounts of material on Ceres’ surface which seem to be from other asteroids. These mostly consist of rock silicates. This discovery indicates that Ceres’ true surface composition is hidden beneath the asteroid refuse, which finally settles a persistent issue in the scientific field: does the surface material of the celestial body in question truthfully indicate its inherent composition? In the past, scientists have often had trouble distinguishing between an astronomical body’s actual composition and the surface effects surrounding bodies—including Saturn’s moon Iapetus and Pluto’s red-faced moon Charon. But recent research shows that by extending studies to the mid-infrared, the composition of a subject can be accurately determined despite the interference from the superior layer of debris. 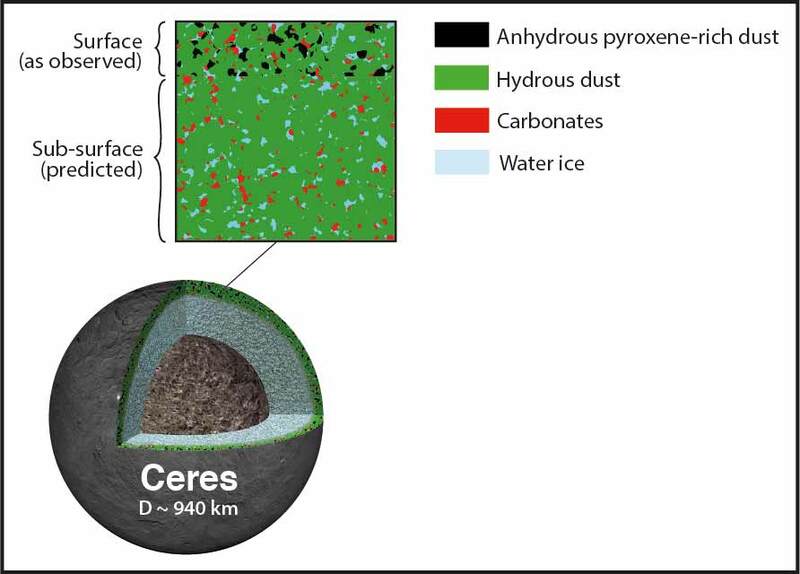 The team’s studies showed that the pyroxene present on Ceres’ surface was the result of interplanetary dust particles from other asteroids. This is why it assumed their color though it differs in composition.